In this study, a pseudo-layered Na super-ionic conductor of Na3V2(PO4)2F3 (NVPF)/C cathode for sodium-ion batteries is prepared successfully using a facile polyol refluxing process without any impurity phases. The X-ray diffraction and Rietveld refinement results confirm that NVPF possesses tetragonal NASICON-type lattice with a space group of P42/mnm. In this preparative method, polyol is utilized as a solvent as well as a carbon source. 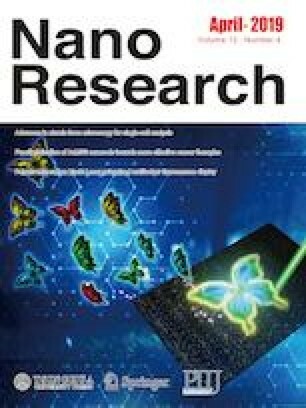 The presence of nanosized NVPF particles in the carbon network is confirmed by field-emission scanning electron microscopy (FE-SEM) and high-resolution transmission electron microscopy (HR-TEM). The existence of carbon is analyzed by Raman scattering and elemental analysis. When applied as a Na-storage material in a potential window of 2.0–4.3 V, the electrode exhibits two flat voltage plateaus at 3.7 and 4.2 V with an electrochemically active V3+/V4+ redox couple. 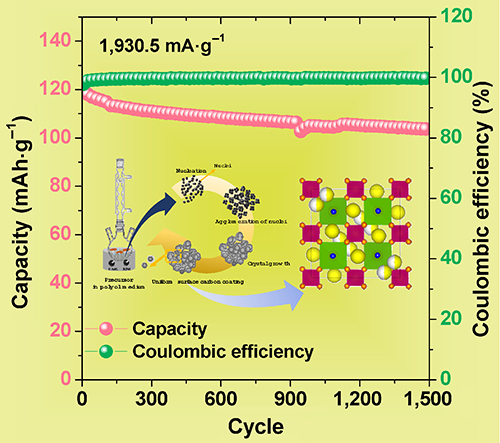 In addition, Na3V2(PO4)2F3/C composite achieved a retention capacity of ~ 88% even after 1,500 cycles at 15 C. Moreover, at high current densities of 30 and 50 C, Na3V2(PO4)2F3/C cathode retains the specific discharge capacities of 108.4 and 105.9 mAh·g–1, respectively, revealing the structural stability of the material prepared through a facile polyol refluxing method. Supplementary material (images of material and methods, TGA, RAMAN, ICP, ECD, ex situ X-ray patterns and FE-SEM for SIBs, lattice parameters and specific energy and power densities calculations) is available in the online version of this article at https://doi.org/10.1007/s12274-019-2322-y. This work was supported by the National Research Foundation of Korea (NRF) grant funded by the Korea government (MSIT) (No. NRF-2017R1A2A1A17069397). This work was supported by the National Research Foundation of Korea (NRF) grant funded by the Korea government (MSIT) (No. NRF-2018R1A5A1025224).